When, in one of many laughter inducing moments, a "native" dives out of a hospital window the dummy hits the floor below with such force that an arm detaches and bounces out of shot. 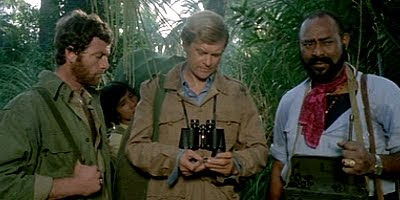 Zombie Holocaust pretty much maintains this level of competence as Ian McCulloch looks lost and Donald O'Brien, who should know better, appears at times to struggle not to laugh as does Dakar. Insofar as there is a plot it is a slice of boys own with a white man's burden colonialist mindset as safari suits get broken out of the mothballs and a visit is paid to an island of cannibals and zombies after the theft of a plastic handled native knife. All primitive people engage in cannibalism and organ farming apparently. Cannibals prance about in Emo Phillips inspired fright wigs spouting ooga boogas to mark themselves out as distinct from zombies who exhibit breathing difficulties as they amble about in Nights Of Terror style Slipknot masks. The film answers the ultimate playground debate of the era and takes sides on the issue of who would win a fight between cannibals and zombies. Some footage appears to be reused from Zombie Flesh Eaters but the film itself is not in the league of the Fulci classic. Indeed this one is awful cheesy fun yet fails even to raise itself even close to the modest standards of Bruno Mattei's Virus.